GateGuru is a free travel helper app for your iPod Touch or iPhone from NYC-based Mobility Apps. When you download GateGuru, it will first ask you to use your current location. GateGuru uses your locale to find the airports that are closest to you. Choose either “Don’t Allow” or “OK.” If you choose “OK,” wait a few moments while GateGuru updates to find nearby airports. Tabs at the top let you choose between the closest airports to where you are geographically and every airport used in the app. The GateGuru application even lets you import your itineraries from Tripit and KAYAK. There are four main selections located at the bottom of the home page. The “Airports” option will be selected by default. If you click on “Trips,” you’ll be shown trip information, but in order to see this you must be logged into your GateGuru account. The “High Flyers” option lets you view the users who have wracked up the most points. You can filter these users by everyone on Gate Guru or just your friends. The “User” option lets you view account information once you’re logged in, including your bookmarks and scores. If you click the “More” button at the bottom of the screen, you’ll be taken to a list of options that includes a “Contact Us” button, an option for sharing Gate Guru with your friends and also information about the company. The best part of this iPhone app is all of the information available for a specific airport. 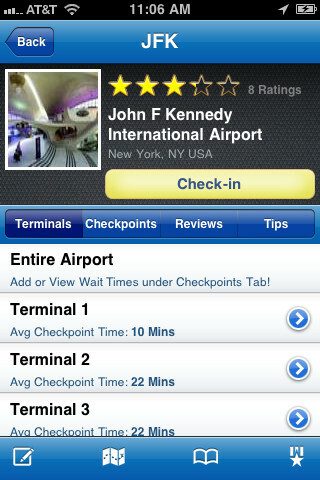 When you click on an airport name, you’ll see a star rating at the top of the page. There are different buttons that let you view the airports terminals and main checkpoint, plus user reviews and tips. If you click on a certain terminal or airport, you’ll get details for that area like what food options are available and the different shops and services in the area. The best part of this portion of GateGuru is that you can add your own amenity to the list. This is most useful for people who use the same airports regularly – you can write yourself a note to remember which concourse had the best cafe or lounge area. The “Tips” button is great to find out basics like if the airport has free wi-fi or not or which restaurant is best. You can also write your own review or tip and get a map of the airport. The landing page of GateGuru is basic in terms of graphics, which is perfect for this type of software – users don’t want a confusing interface when trying to quickly find flight and airport information. GateGuru works quickly and moves from screen-to-screen smoothly. It’s useful for both people who fly frequently and those who don’t, because it offers up tons of information that you’ll never know you need until you need it. In order to save your iPhone’s battery life, though, turn off the GPS location option while you’re not using the app. 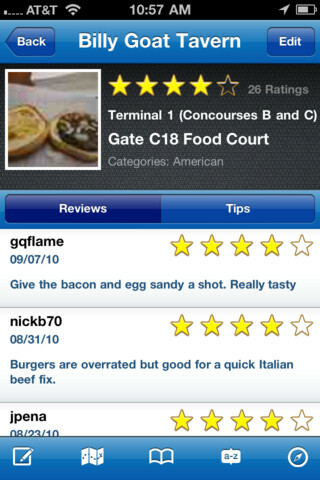 AppSafari review of GateGuru – featuring Airport Maps was written by Joe Seifi on November 27th, 2011 and categorized under App Store, Featured, Free, Reference, Shopping, Travel. Page viewed 3852 times, 1 so far today. Need help on using these apps? Please read the Help Page.